50 Cent-ს მოსწონს Lloyd Banks-ის ბითები. 2014წელს, როცა 50-მ გამოუშვა ალბომი 'ცხოველური ამბიცია', მან გამოიყენა Lloyd Banks-ის სიმღერის მწვანე დღის(+Havoc+Cormega)prod. by Ty Fyffe სიმღერის ბითი, მიქსთეიფ V.5-დან, თავისი სინგლისთვის 'მოინადირე კონტრაქტი'(+Prodigy+Kidd Kidd+Stypes P).ეს სინგლი არის 'ცხოველური ამბიციის' ნაწილი. Cardiak-მა შემქმნელმა Lloyd Banks-ის დამრტყმელი სინგლის Start It Up(+Kanye West+Swizz beatz+Fabolous) განცხადა, რომ start it up-ის თავდაპირველ ვერსიაში იყო 50 Cent-ის რეპიც, მაგრამ შემდეგ 50 cent ჩაანაცვლა Kanye West-მა. უკვე 50 Cent-ს უნდა გამოუშვას 'Start It Up'-ის თავდაპირველი ვერსია, თავისი ალბომის 'ქუჩის მეფე უკვდავიას' გავლით. 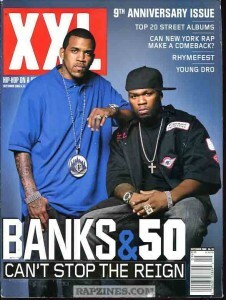 50 Cent აგრეთვე უნდა, რომ გამოაქვეყნოს Lloyd Banks-ის ოქროს ჰიტის 'Beamer, Benz or Bentley'(+Julez Santana), საიდუმლოდ დარჩენილი რიმიქსი, რომელშიც თვითონაც არის. 50 შექმნა ეს რემიქსი Lloyd Banks-თან და Slim Thug –თან ერთად. მაგრამ შემდეგ გამიცა განსხვავებული რემიქსი 'Beamer, Benz or Bentley'-ის Ludachris, The-Dream, JadaKiss და Yo Gotti მონაწილეობით.